International Trade is one of the main areas of business for most commercial banks in Sri Lanka, Efficiency in handling and processing proper documentation is vital in this business. 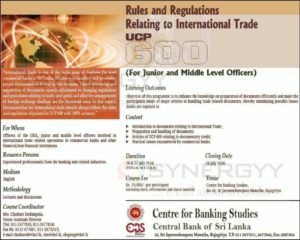 Timely processing and negotiation of documents, speedy adjustment to changing regulations and procedures relating to trade, and quick and effective arrangements of foreign exchange dealings are the important areas in that regard Documentation for international trade should always follow the rules and regulations stipulated in UCP 600 with 100% accuracy. Objective of this programme is to enhance the knowledge on preparation of documents efficiently and make the participants aware of major articles in handling trade related documents, thereby minimizing possible losses banks are exposed to. Practical issues encoumered by commercial banks. Officers of the CBSL, junior and middle level officers involved in international trade related operations in commercial banks and other financial/non-financial institutions. Experienced professionals from the banking and related industries.